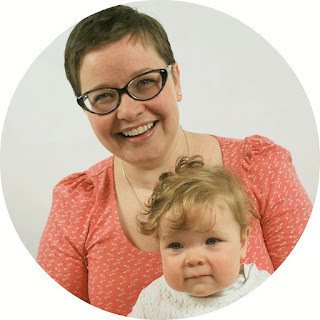 If you're anything like me, your stash is still overflowing, despite our November destashing! My worst is my scrap bags, I separate them into similar colours and store them in zip lock bags in a couple of tubs. 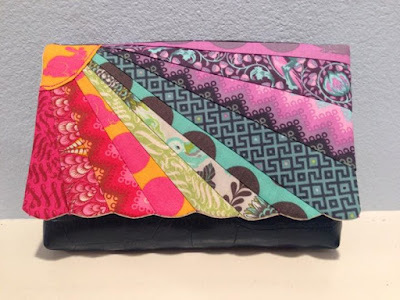 Last week I went to put away yet more off-cut scraps and couldn't wedge those bags back in the tubs no matter what I tried...so I figured, I'd better do something with some of them! 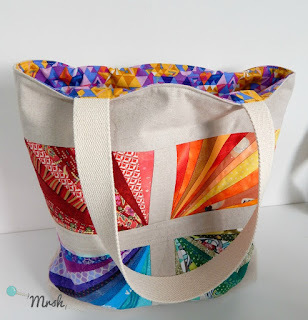 I wanted to make a basic shopping tote which I could take with me whenever I went out. In Wales, shops have had to charge 5p per single use bag (plastic bag) for a few years now, so it's handy to get in the habit of taking your own shopping bag with you whenever you go out, in case you pop into a shop for a few provisions. I turned to the Sunburst clutch, and inspired by Katie's version, decided on a rainbow theme. 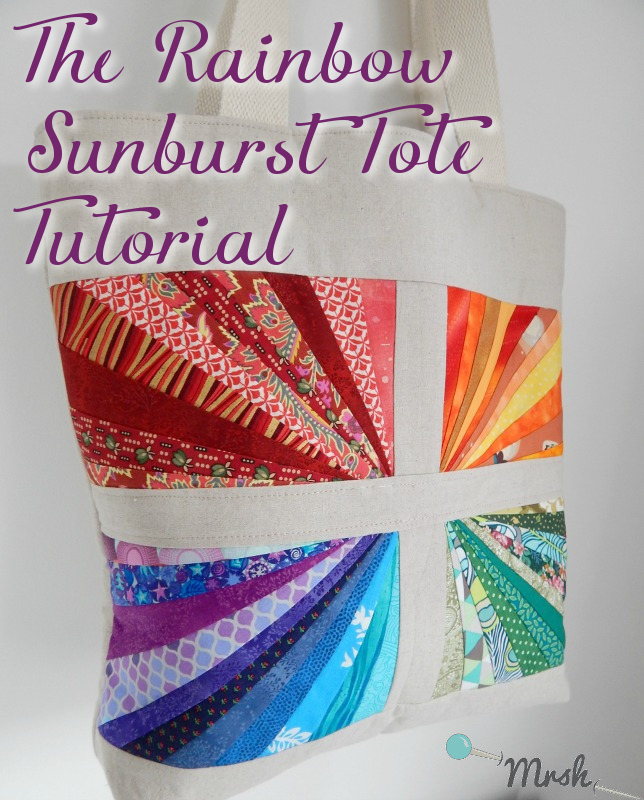 If you'd like to make your own, all you'll need is a copy of the Sunburst Clutch pattern, and today's handy tutorial! You can use a foam stabiliser, but I wanted a more relaxed slouchy bag, so that it could be tossed in the car boot, or into my handbag to take shopping. Here's how mine stands up with fusible fleece. Aside from the rainbow panels which we'll talk about in a minute, you will need to cut the following. (2) 2" x 5 1/2"
(1) 2" x 18 3/4"
(2) 4 5/8" x 18 3/4"
(1) 18 7/8" x 18 1/2"
(2) 18 7/8" x 18 1/2"
1) To begin, please print 4 copies of page 10 of the Sunburst Clutch pattern, you will be using two on the right side and two on the wrong side. 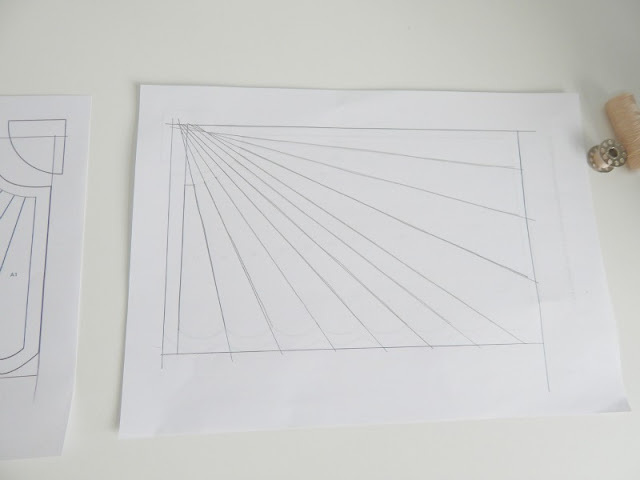 For the two on the right side, draw lines to connect up the rectangular section. We will be ignoring the scallops. 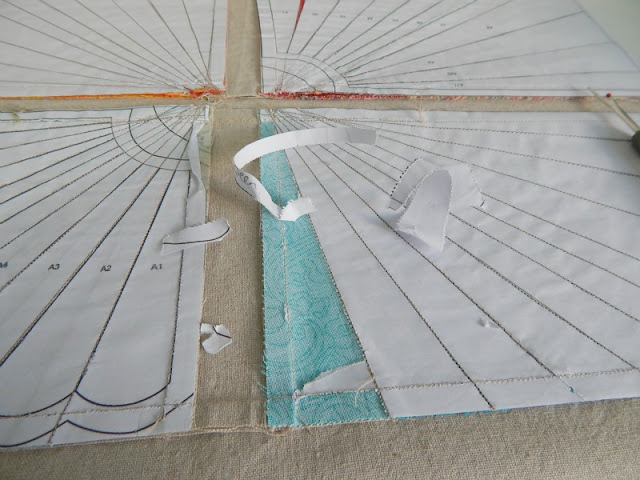 You can also continue the 'ray' stitching lines all the way to the end too if you'd like. I've been reliably informed that Golden piecing paper (thanks Kate!) is probably the best paper to use for this, I used regular printer paper and had a job removing it all at the end! 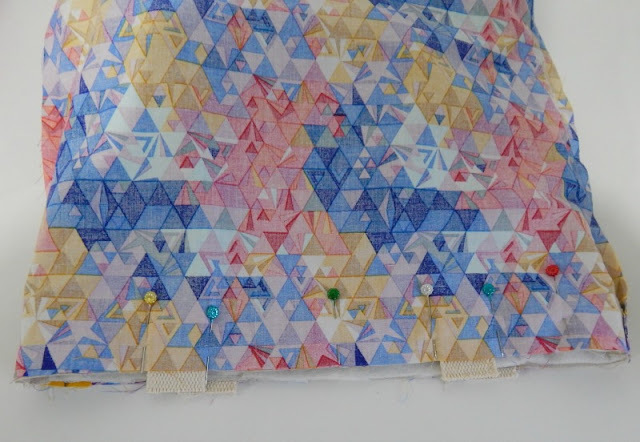 2) On the two which will be the wrong side, trace the 'ray' stitch lines, the edge lines and connect them up with top and bottom lines. Don't worry about the corner where it seems to get a bit tight, it all works out in the end. 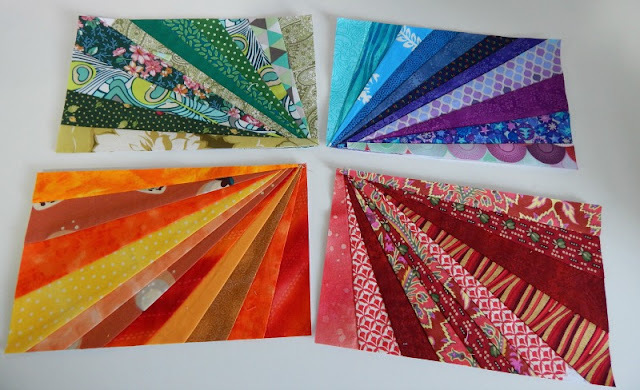 Before you start sewing, place your templates face up and decide your colour placement. I wrote on my templates which colours I wanted to start and end with for the yellow/orange and the blue/purple. 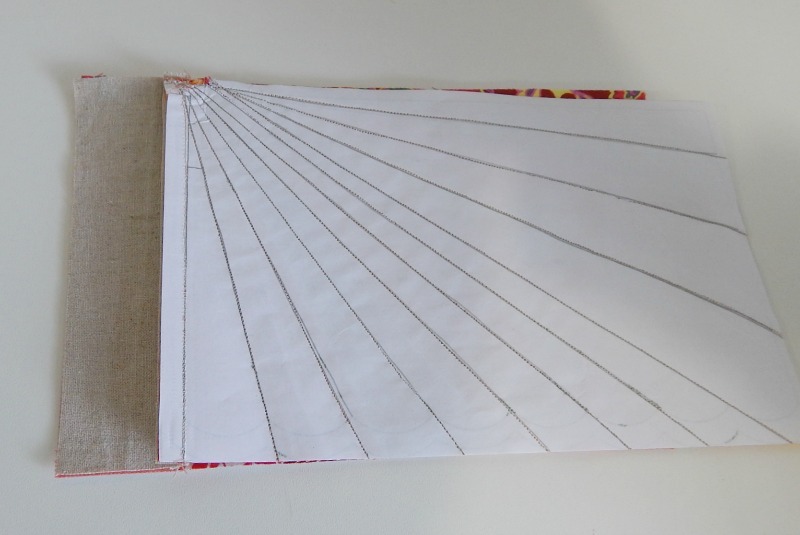 Don't forget you will be stitching on the lines, and your fabric will be on the back of the paper. If in doubt, start your first panel and then it'll all become clear by the time you come to do the second. 3) Follow the Sunburst clutch pattern steps 1) - 6) to create your sunburst panels. I recommend doing each panel on it's own so that you can then sit it next to the others to decide where you'd like it to go. You don't have to use rainbow colours, you could use any that you like! We'll leave the paper in place until later to help with the stability of these panels whilst sewing. From here on, use a 3/8" seam allowance. 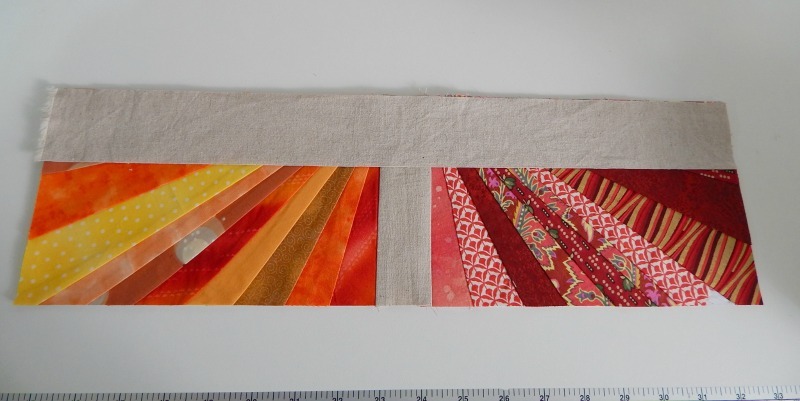 4) Next we'll add sashing using the 2" x 5 1/2" linen strips we cut. 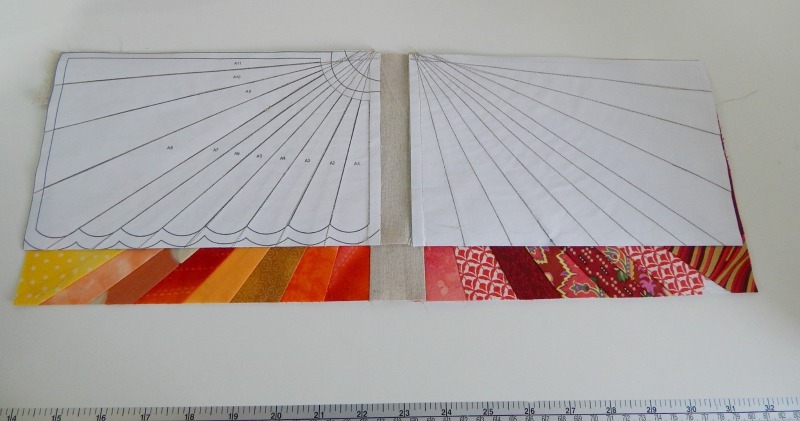 Lay one paper pieced panel face up, then stitch the long side of the sashing to the edge you'd like to be the middle. Repeat for the second side and the panel you'd like next to the panel you've just attached. You should end up with something like below. You could stitch the panels together as they are without the sashing for a really bright tote! 5) Next add the 2" x 18 3/4" sashing along the middle long edge of the panel you've just sewn. 6) Then repeat for the other two panels, and the 5 1/2" sashing. Then attach those to the 18 3/4" sashing. 7) Finally we'll add the top and bottom sashing, these are the 4 5/8" high pieces. 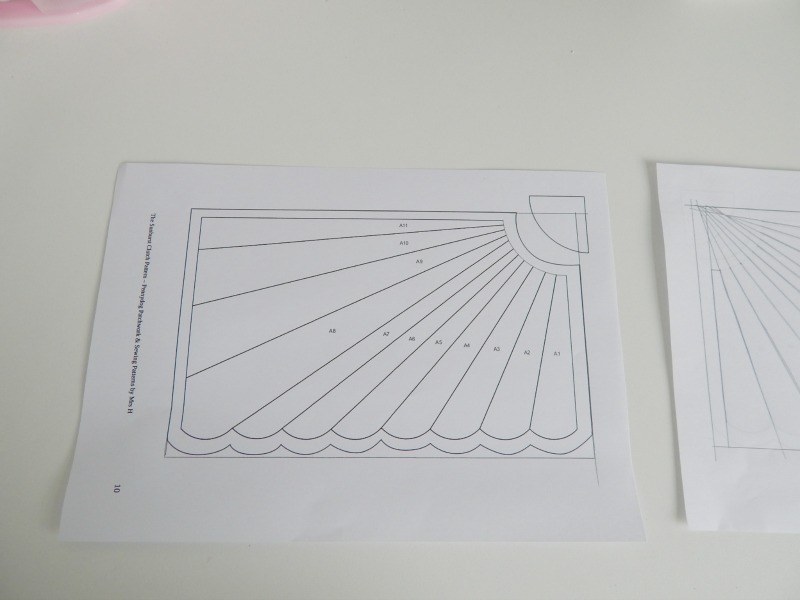 Sew one to the bottom of your centre panel, and the other to the top. This will create your front panel of your shopping tote. From here on you can consider this a work of art! 8) Now it's time to remove that pesky paper! This is definitely my least favourite part of this process! I wouldn't worry too much about every tiny piece of paper, just enough until you're happy. 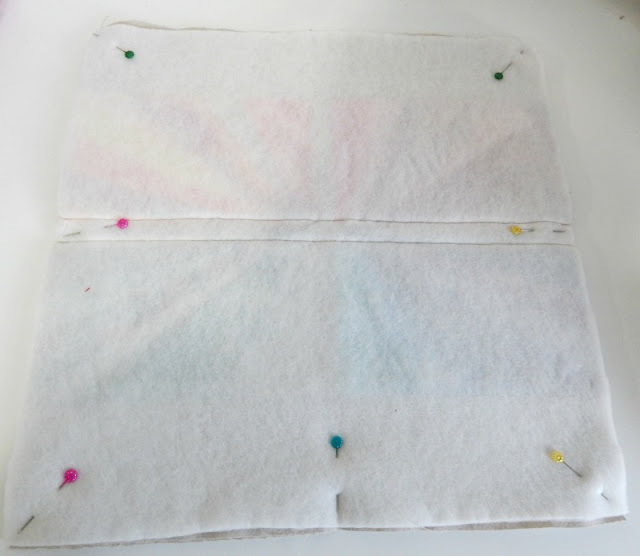 9) Now you can fuse the fusible fleece to your front and back bag panels, this will be the rainbow panel, and the large neutral fabric panel which you cut earlier. 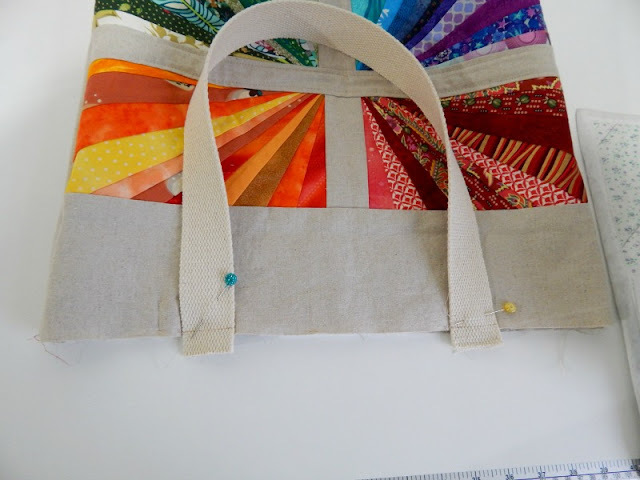 I chose to add a little quilting along the central sashing to make sure my fusible fleece stayed in place when my bag was in use. 10) Next we'll sew the front and back together along the sides and bottom. 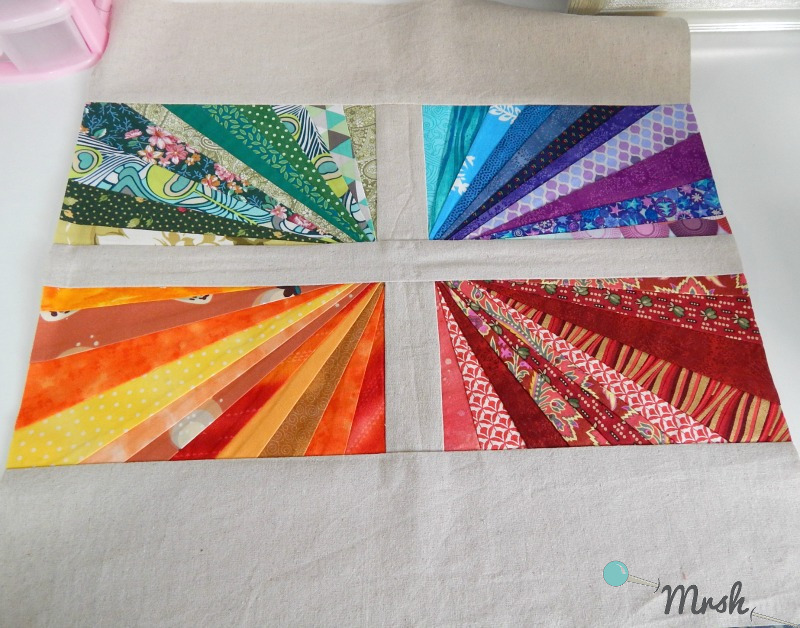 Just make sure your rainbow panel is the right way up before you sew, you don't want to sew along the top! 11) Flatten the corners out and pop a pin through the seams. Draw a line 4" wide across the point of the corner. 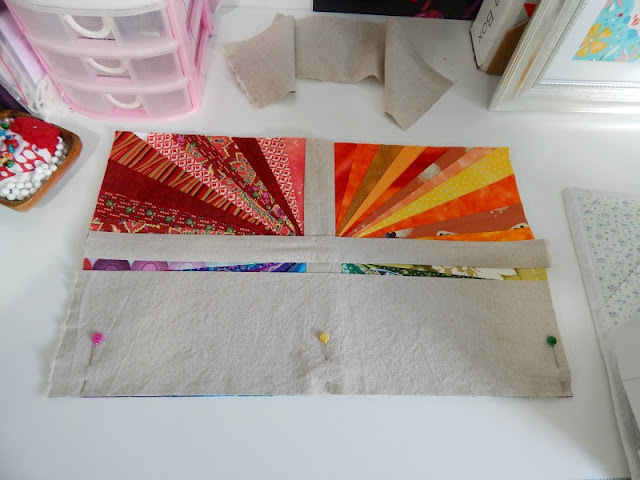 We'll sew along this line to form the boxed corners. 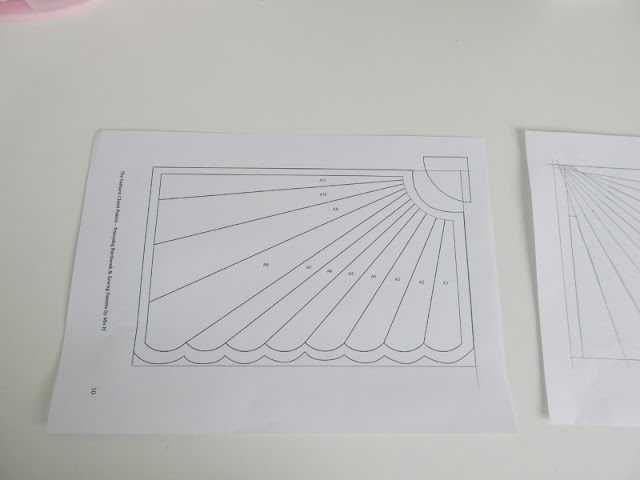 12) Repeat for the other corner, and then repeat steps 10) to 11) for the lining panels, but this time leaving a generous 5" turning gap in either the bottom or one of the side seams. For a really neat turning gap, you can stitch this with a long basting stitch, press with a steam iron, then remove the stitches before turning through. This will help you turn the gap under neatly at the end. 13) Place the cotton webbing handles in place along the bag outer and pin in place. You should measure 3 1/4" from the centre of the bag to the start of each handle, and hang 1 1/4" over the top edge of the bag. This will ensure that the handle is also sewn into the final top stitching, strengthening the handles. Stitch these into place, then repeat for the second handle and the back of the bag. 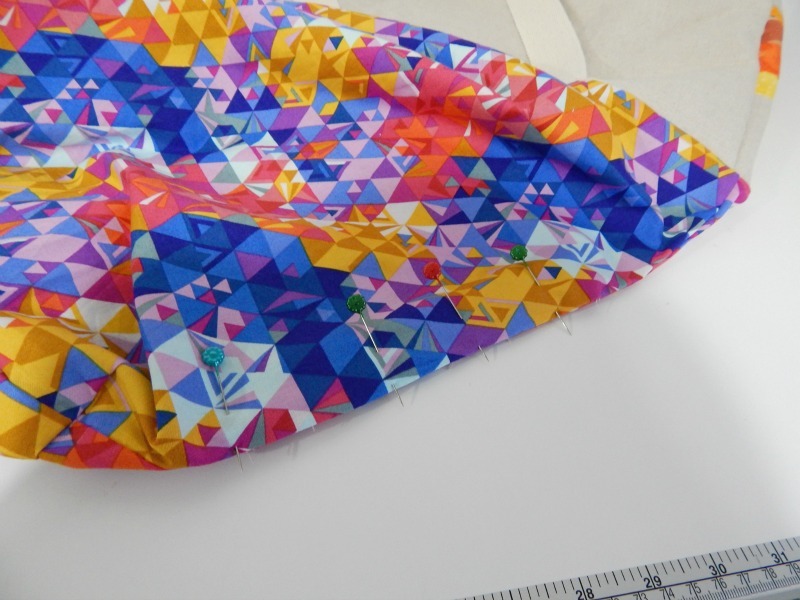 14) Place the bag outer inside the bag lining, right sides together, matching side seams and raw edges. 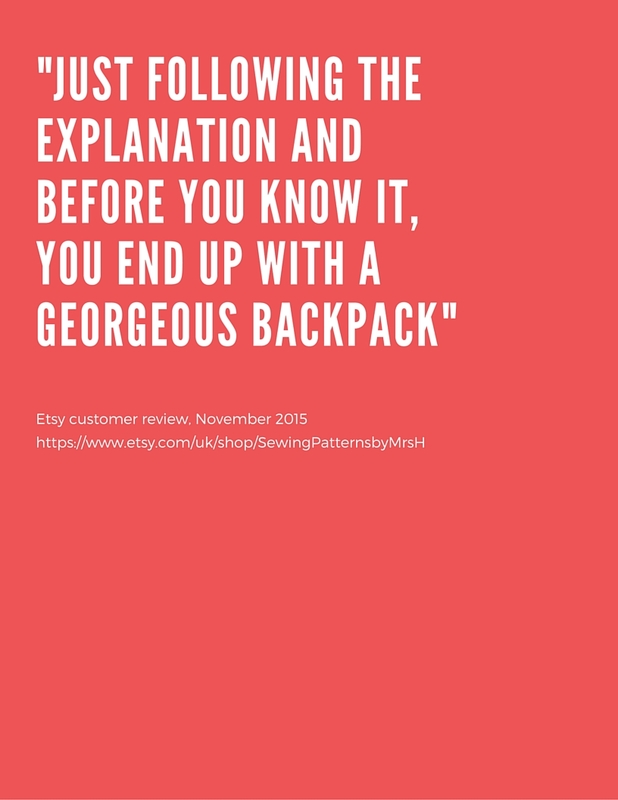 Sew around the entire top of the bag. 15) Turn the bag right sides out through the lining turning gap, then turn the seam allowances under and pin in place. 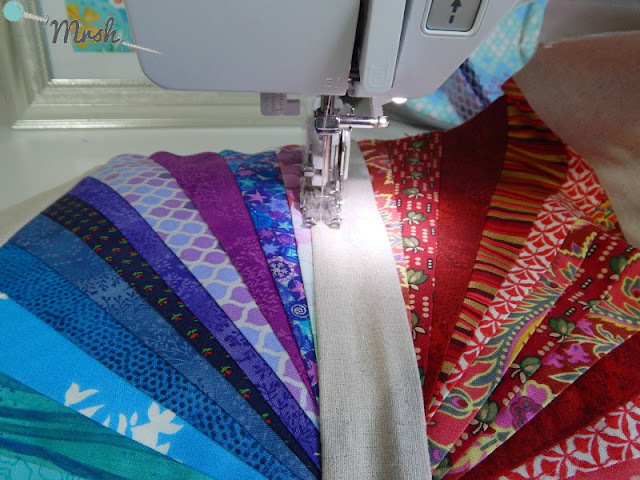 Stitch the gap closed using a close machine stitch, or a hand ladder stitch. 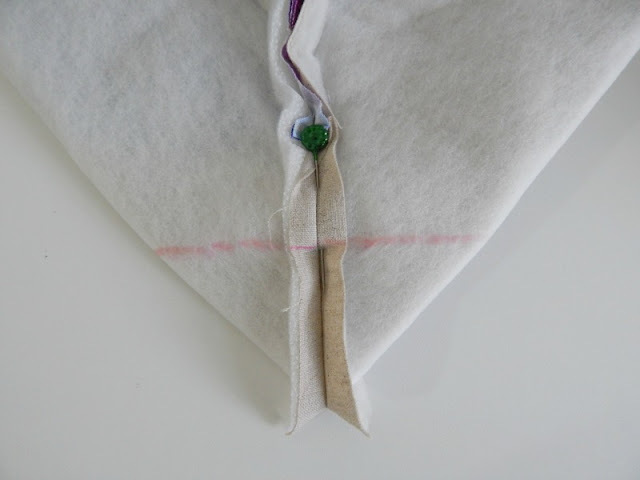 16) Tuck the lining into the bag outer, press around the entire top and pin into place. Top stitch around the whole top of the bag using a 1/2" seam allowance to keep the lining in place. 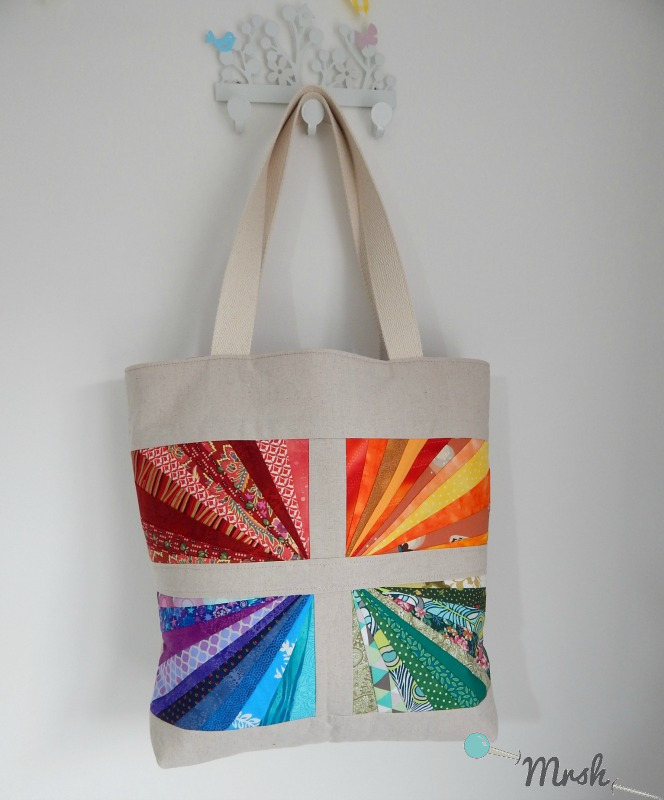 Now you're ready to hit the shops with your bright Sunburst tote! 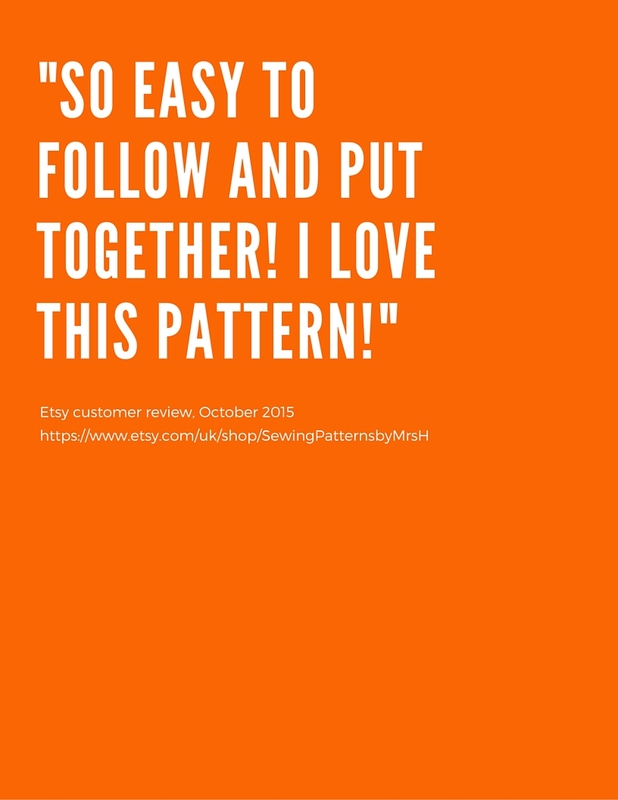 You could use it for lots of other things, but buying more fabric appeals to me! 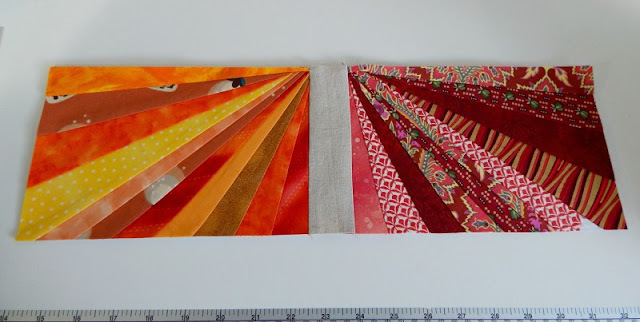 I used Alison Glass Geometry in Sunset from her Ex Libris collection for the lining. It just seemed to suit so well! 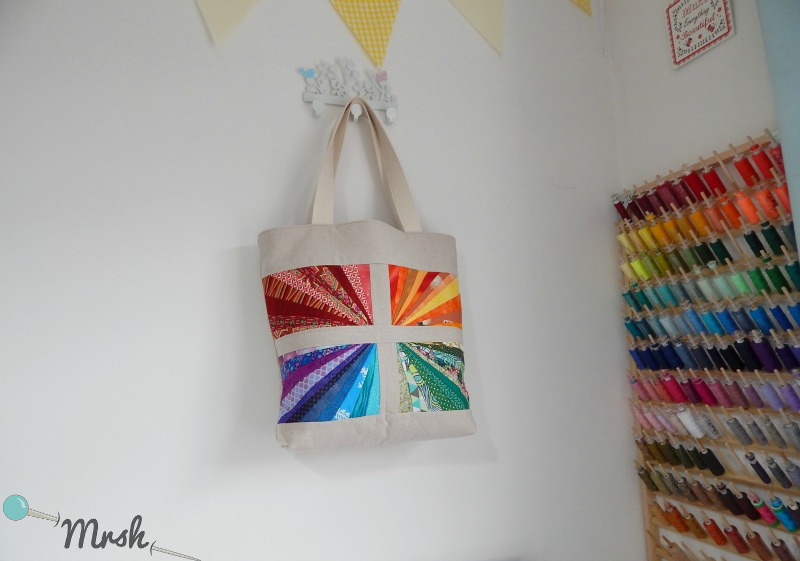 I'd love to see your Sunburst totes, don't forget to tag me on instagram with your Mrs H makes @sewingpatternsbymrsh or share them in my facebook group! 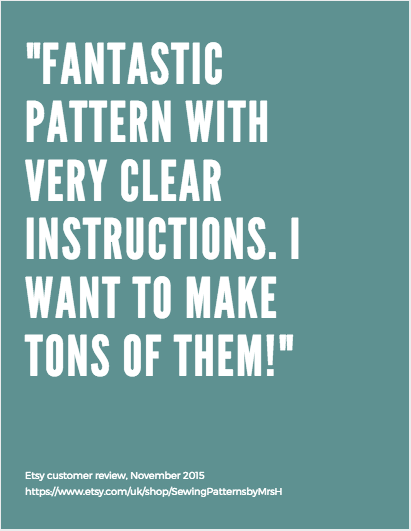 What other patterns do you like for stash-busting those scraps? 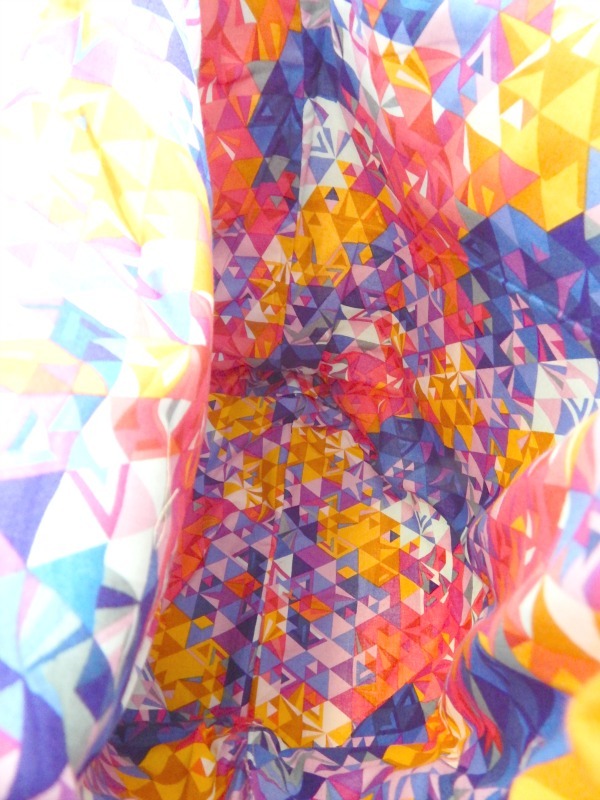 What a fab bag! Bet it didn't make a dent in your scraps though! I am always SO impressed! What a dramatic effect. England has the bag charge now too so I could do with a handy shopping tote. I like how sturdy and roomy this one is compared to other totes I've seen.